Take a walk along the beautiful, white sandy beaches of Hawaii when you trip with this strain of magic mushroom. This magic mushroom tends to be a bit on the strong side, known for its powerful psychedelic effects and relaxing, peaceful state of mind that it puts you in. If you want an intense, life-altering trip, McKennaii will not disappoint! Strong and Intense High. Get ready for one of the most unique, intense and life changing trips you will ever experience. The buzzing joyous experience you’ll have will be unlike any other one before. Each trip is a pleasant surprise waiting to be discovered. 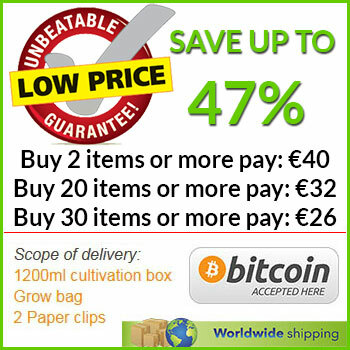 For Novice to Experienced Growers. Whether you’re somebody who uses shrooms all the time or are an occasional user, this shroom type will be perfect for you. Because it’s so strong, it may be a little too much for first time users. No Fillers and Additives; Just Pure Shrooms. We only use real shroom in our products with no added ingredients. We care about quality and practice the highest standards. Fast First Flush (Just after a Few Days). Stop waiting around for weeks for your mushrooms to grow. This type is an extremely fast grower; it grows after a matter of days instead of weeks. Explore Altered States of Consciousness. If you want to dive in and div e out of worlds that have been locked away in your mind, then this is the perfect strain to do so. You will be in different time zones, landscapes and universes with the McKennaii. Get ready to trek through active volcanoes and paraglide from cliffs over the calming shores of Hawaii with this strain. Be sure to order now for an epic trip! Before you open the Magic Mushroom grow kit, be sure to close all of the windows and doors in the room to prevent drafts. This helps create a stable environment that does not introduce damaging microorganisms to the mushroom growing set up. Disinfect the container or surface where you will place the grow box and cake from the mushroom kit. It is very important that no bacteria or mold spores and similar contaminants touch the Magic Mushroom grow box. Also, scrub your hands and arms with antibacterial soap and rinse off all residue well. Consider wearing surgical gloves and mask to minimize the chance of affecting the growing medium and bag. Open the box carefully and remove the Magic Mushroom grow kit, paperclip, and bag. With your gloves and mask in place, take the lid off of the kit. Rinse this well and put in a clean location to use later. Likewise, protect it from contaminants as much as possible. Set up the plastic grow bag on a steady surface and sent to the mushroom growing kit firmly in the bottom. Loosely tuck the open top of the bag under the grow box so that the perforated side is on top. There is no need for additional air circulation at this stage of the mushroom growing process. The growing kit should stay in a reasonably bright location out of direct sunlight. 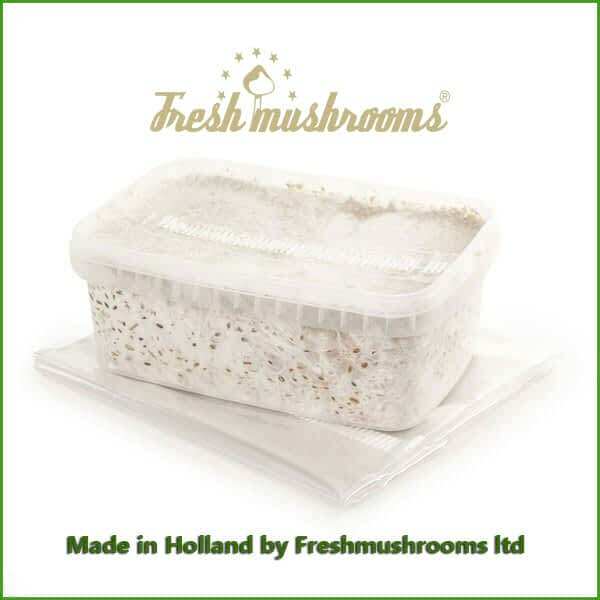 The ideal temperatures for mushroom growing range between 18 degrees and 28 degrees Celsius. This will get you the biggest harvest. If your room does not stay between these values, consider purchasing a heat mat to set under the mushroom growing kit. Approximately one week after you set up the grow kit for cultivation, the first mushrooms called pins will appear. At this point, pull the folded top of the bag out from under the grow box and open it up on top. This releases excess moisture and helps the mushrooms grow bigger. Do not water them. In two weeks from the initial set up, the first mushrooms are ready to harvest. This must be done before any spores are released. Depending on the temperature, moisture levels, and other factors, the mushrooms may take a little less or more time to reach maturity. The Magic Mushroom growing kit gives you repeated harvests to enjoy for a long time. After you pick the first batch, pour clean, cold water into the grow bag. Put the clean lid over the box, wait 12 hours, carefully pour off the excess water, and begin the growing process over again. This "cold shock" reinvigorates the mushroom spores and replaces any lost moisture used when growing the first ones. In order to maintain proper temperatures for the mushrooms to grow their best, use an electric heat mat under the kit box. It is most important to use this for the first two days of the growing cycle before the first indication of pin mushrooms appears. Leave the heat mat off for approximately one week until the pins develop, and then switch it back on again. During this process, keep the top of the bag slightly open to prevent excess moisture buildup. If the buds of the pins have not appeared within 10 days, turn the mushroom cake on its side inside the grow box. Then, begin the heat match process over again. 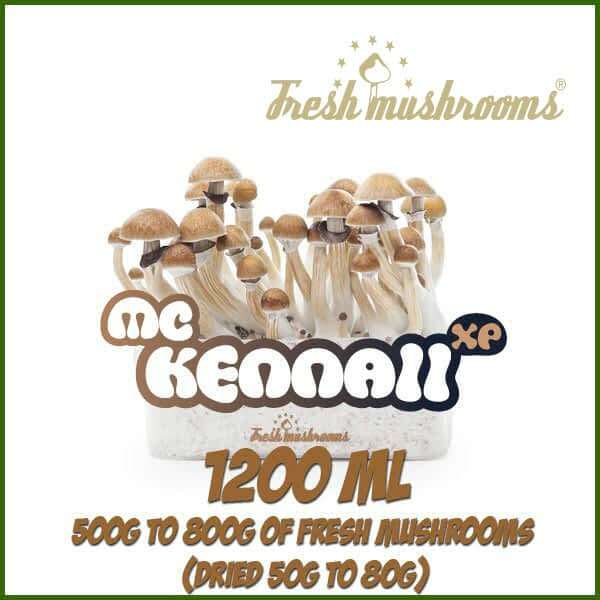 Start using your Mckennaii Magic Mushroom grow kit as soon as you receive it. If you cannot do so and want to delay cultivation, place the kit inside a soaking bag and tuck it into your refrigerator for up to four weeks. This will keep the mushroom spores in stasis and allow them to grow once you take them out and warm them up. The perfect mushroom growing temperature is 24 degrees Celsius. They should grow successfully anywhere between 18 and 29 degrees Celsius in most cases. Maintaining proper temperature may require a heat mat in colder rooms and climates. Mushrooms do not need elaborate lighting setups to grow. However, the mycelium does need to sense surface light in order to develop into mushroom bodies. This can be achieved with indirect sunlight or a fluorescent light bulb for just a few hours every day. Do not use a strong grow lamp or put the growing church in the direct sun. With the right conditions, small mckennaii mushroom pins appear above the surface in approximately one week to 10 days. Grow times may be longer for certain varieties of mushroom such as Psilocybe cubensis. The clumps of growing mushrooms are called flushes. Unlike neat rows of plant crops spread out at even intervals, mushrooms grow in groups. With the growing kit, the first and second flushes will have more mushrooms in them. As you repeat the growing process, expect smaller harvests. Understanding when and how to pick the mckennaii mushrooms gives you a better result. Look underneath the cap to see if the veil between it and the stem has separated. Put on your latex gloves after washing your hands and arms and carefully pick the mushrooms that have reached the state. Leave the smaller and un-separated ones alone until they grow more. 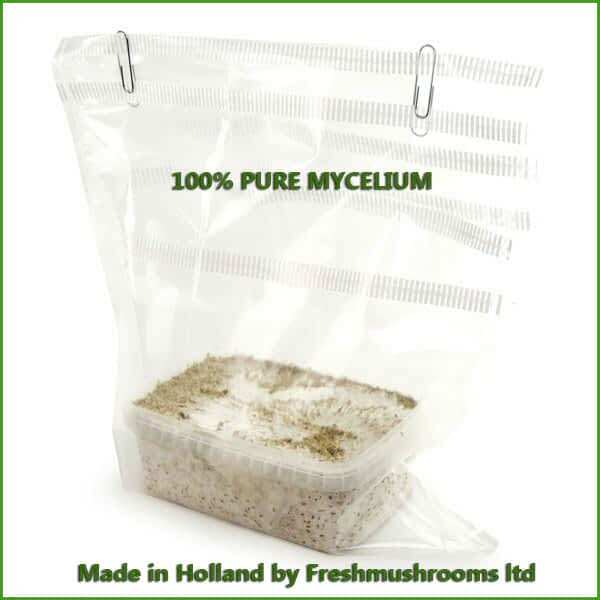 This a growing kit helps you pick mushrooms more easily by leaving off a harder vermiculite light. All you need to do is grasp the top of the mushroom and pull it out of the cake. This process does not need much force so be careful not to remove mushrooms that are not ready yet. Anywhere the light touches on the growing cake can sprout mckennaii mushrooms. Some growers wrap foil or dark paper around the sides of the box to help prevent this. Others simply let the mushrooms grow and harvest them just like the ones from the top of the cake. There really is no difference between those that grow on top and the sides as long as they receive the same amount of light and moisture. However, if too many mushrooms grow on the side of the grow cake, it may become stuck in the box. After washing your hands and putting on gloves, lay your palm over the grow box and gently turn it over until the cake falls out. Pick the mushrooms from the sides while it rests in your hand or is placed on a disinfectant surface. After the side mushrooms are removed, simply put the cake back into the box. Although the Magic Mushroom grow kit may have more than one flush of mushrooms, it will not continue to grow them forever. If nothing grows in three weeks, it is a sign that this kit is done. This also applies if the cake turns gray, green, yellow, or red, which is the sign of contamination. If either of these things happens, dispose of the mushroom growing kit in your outside garbage can. Mushrooms drop spores if you do not harvest them early enough. Depending on the species of mushroom in your kit, this will make the cake look black, purple, brown, or red. If this occurs, the mushrooms may still be harvestable. However, they will not be in prime condition or maximum potency at this time. Yes my kit arrived in 3 days! I had some trouble with the bank transfer. So i used bitcoin. Setup was easy and it works great. I will updats you on the shrooms. The truffles where great! This grow kit is very easy to use. On my third flush now . Good blue mushrooms. From all the strains i have tried, these are my absolute favorites. The product itself has improved over the years, so I highly recommend these grow-kits.